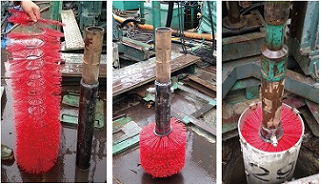 All purpose brush for cleaning all types of casing and screen including PVC! 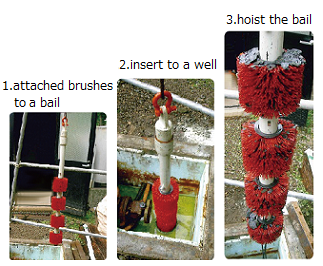 Floating brush design ensures free movement, which virtually eliminates binding or “hanging up” inside the casing! 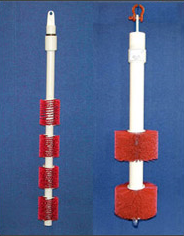 Interchangeable brush design allows you to select the brush size to match the casing to be brushed! Durable! Will not wear out as quickly and holds its shape better than conventional steel-bristled brushes. 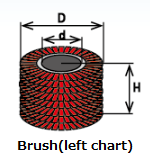 Heavy-duty bristles are made of the highest quality polypropylene. <Attention > We have revised the price for the items manufactured by COTEY due to price increase of the materials price and the freight since January 2019. 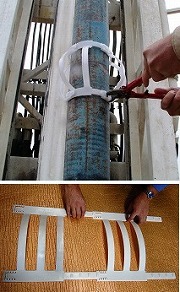 Can be assemble to your drill rod or cable or pipe. Original bails are also in sellable. Specialties The Klamp allows workers to bring pipe up to an easy working level.Equipped with serrated and hardened replaceable jaws. It is one of the safest time saving tools you will ever own. Others Excellent holding capability with load tests over 3000 lbs. ※This sample photo shows that KLAMP is holding 50A stainless steel pipe. ※For other sizes, please contact us. Specialties Vise features a rugged cast steel base with pipe rest and bender. Specialties This model will centralize casing and sheathing. Copyright © 2019 SWATO INC. All Rights Reserved.